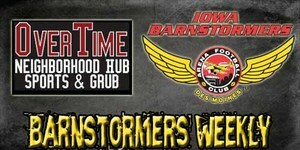 03/08/2011 7:59 PM - DES MOINES – The Iowa Barnstormers of the Arena Football League are pleased to announce that once again this season, OverTime Neighborhood Hub Sports & Grub in Urbandale will be the official home of the Barnstormers Weekly radio show. The show will air live from OverTime each Tuesday night from 6:00pm – 7:00pm on AM1700 THE CHAMP, the flagship station for the Iowa Barnstormers. Veteran sports broadcaster Joe Stasi returns for a fourth season as host of Barnstormers Weekly. Each show will feature live interviews with Barnstormer players and coaching staff, along with a re-cap of the previous week’s game and a preview of upcoming opponents. There will be food and drink specials for Barnstormer fans and season ticket holders along with great prizes all season long. OverTime Neighborhood Hub Sports & Grub is located at 4810 86th Street in Urbandale, just South of I-80/35. The first show of the 2011 season will air on Tuesday, March 15th. Fans of all ages are encouraged to come out for the first ever Barnstormers kick off Barbeque. This will be the first time this season that the general public will be able to meet the entire Barnstormers team. The 2011 Iowa Barnstormers season begins on Saturday March 19th with a road contest against the Pittsburgh Power. The home portion of the schedule begins Friday, March 25 when the defending Arena Bowl Champions the Spokane Shock come to Wellmark Field. Season tickets remain on sale for as low as $117 per seat, while individual game tickets can be purchased for any regular season game at the Wells Fargo Arena Box office or by calling the Barnstormers at 515-633-2255. For all of the latest Barnstormers information log onto www.theiowabarnstormers.com.